Phoenix Running is one of a number of companies that organise small marathon and timed challenge events on lapped courses. 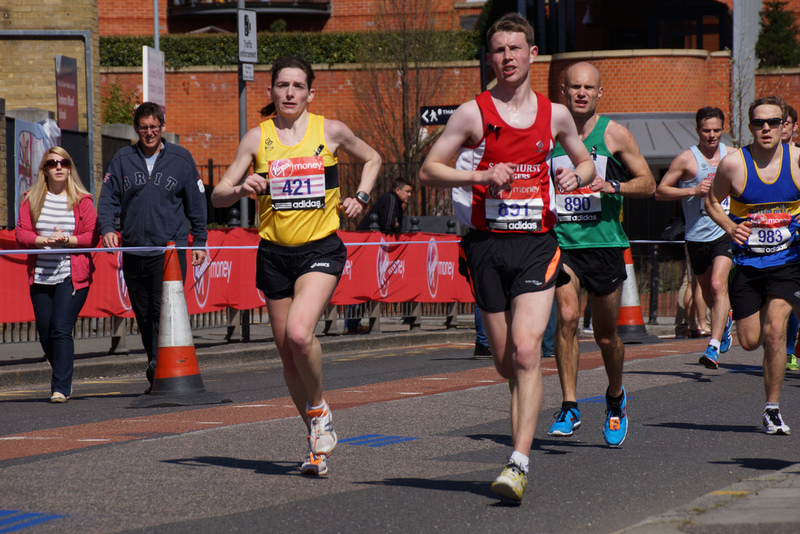 They base most of their runs along the Thames by The Weir Pub near Walton, with race registration at the nearby Elmbridge Excel Leisure Centre. As the name suggests, this pair of marathons is aimed, only a little tongue in cheek, at people chasing numbers on their way to 100 (or multiples of 100) marathons. Now, I said to myself that this was not something that I was interested in and I’m not in a race with myself to get to 100 marathons by any particular date. The medal for this is also bloody huge, which was another thing I told myself I wasn’t really interested in. So it was with some guilty feelings at my mental weakness that I arrived at Walton on Thames on Saturday morning, just two weeks after my 50 mile epic adventure at Surrey Tops and a week after getting over a bout of flu. I arrived early ahead of the 8am race registration opening time, parking was easy and the leisure centre was open to use their loos. I checked in and soon some familiar people started arriving, including Leon Hicks and Lance King. After a short race briefing outside the leisure centre, we set off for the start, just a 5 minute walk away to drop bags by the aid station. The course for the two runs was going to be the same both days and consisted of out and back loops along the river from The Weir pub upstream to a point just a few hundred metres beyond Walton Bridge, then turn around and come back again. The start/finish is by a large weir and the pub patio and seating and after a short section of tarmac you are on a wooded path with occasional boats moored alongside for a few hundred metres, before the path opens out on to the concrete slipway of a rowing club. This leads on to gravel paths for the most of the rest of the way past a lot of fancy houses, another nice pub (The Anglers), over a steep footbridge by a boatyard and chandlers, under the big steel arch of Walton Bridge, under some willow trees to the turn point at 1.6miles. Each lap is 3.275 miles making 8 laps for a marathon. So, at the start of Day 1 I was feeling OK, over the flu and my legs felt fine. As I knew I was running the next day, today was mostly about finishing in a reasonable time with as little damage as possible, so I set off at a reasonable 10 min mile pace chatting along with Leon for 3 laps, then keeping going at that pace until 4 laps, making half way in 2:15. Having got to that point and realising the cut off of 7 hours gave me masses of time, I wasn’t too upset that the wheels seemed to fall off, with both knees and hips feeling increasingly tight. I tend to feel like this trying to run a couple of days after a marathon, and I can usually manage a gentle 5 or 6 miles with the Tuesday slow runners, so I figured that the Surrey Tops (and flu) had taken it’s expected toll and I was rightly feeling tired and stiff, even though it was two weeks after that event. In this situation, it can be easy to let your mind wallow in the pain and just convince yourself that it isn’t worth it. This is where the ultra runner’s mentality needs to kick in, where the key objective is to keep making forward progress until you finish or you miss the cut-off and get pulled from the race. Forget the pain in your legs and look around for things to cheer you up, which could be anything; other runners cheering you on or chatting, people out walking their silly dogs, rowing eights training on the river, swans and geese coming in to land, Hotblack Desiato’s amazing all black stealth barge moored at the boat yard. The other thing was I knew I was going to come back the next day and do this all again, so I had to spend the remaining time trying to recover as much as possible. I was reduced to a fast march to try and stretch out stiff muscles and reduce calorie use and dehydration. I spent remaining laps when by myself eating as many jelly sweets and Freddo chocolate bars from the aid station as possible and concentrating on walking technique to keep going at sub 14 minute miles. Occasionally I’d catch up with another runner and chat. I finished in 5:34, Leon came in not long after in 5:48 and Lance at 6:07. I downed a couple of recovery drinks (milk and a chocolate milkshake) and headed for home. In the afternoon, I felt just about OK, so the recovery walk seemed to have done some good. I had a relaxing hot bath and stretch and a roast dinner and walked around and did a few stretches during the evening. I put compression tights on to sleep in and got to bed reasonably early. The next morning, I could walk quite well, managing the stairs without having to come down sideways. I had my usual porridge and banana breakfast and coffee and hit the road for Day 2. There was no Lance or Leon to keep me company this time, but still some of the people from the day before and a new selection of the Usual Suspects out for a Sunday run, including Traviss Wilcox, Race Director of Kent based SVN Running Challenges and former president of the 100 Marathon Club. After a presentation to Lorraine Croucher for completing 52 marathons in 52 weeks and the familiar race briefing, we set off to the start. Problems started almost immediately. I thought I would jog gently for a while to warm up and ease the legs back into life, but after half a mile I had a lot of pain on the outside of both knees, which was all to do with tired and stiff quads. The warm up needed to be a lot gentler, so I walked for half a mile and then tried running. I managed about 5 minutes of running before the pain was too much and I was walking again. After doing this a couple of times, I found out it didn’t seem to matter what pace I was doing my running breaks, I could just last about 5 minutes, so the new tactic was to walk until my knees eased off, then do an interval run at sub 8 minute mile pace. This seemed to keep the average pace at a level where I kept up with some of the other runners and made sure I could finish well inside the cut-off time. So, Day 2 was an uncomfortable learning experience, but I finished, though in a pretty slow time of 6:08, but I wasn’t completely broken or injured. In fact, as soon as I stopped trying to walk or run I instantly felt much happier (funny, that!). I got the ridiculously big running number medal hung round my neck, saw a few remaining people finish and then headed home for more recovery. Two days later I was feeling better and managed a nice chatty recovery run with one of the Tuesday slow groups.